R.J. Rushdoony: 00:01 Between July 1970 and April 1971, three fourths of the year. It went through fifteen major printings, tremendous additions. Some of them as much as 100,000 copies. It also had a Literary Guild addition, a Psychology Today Edition, as well as other printings. It has been enormously popular. R.J. Rushdoony: 02:17 This is the hatred of God that is in the heart of man. As our Lord said, speaking his wisdom ages ago, ” He that sinneth against me wrongeth his own soul. All they that hate me, love death.” Proverbs 8:36. And the love of death governs our politics, our education, our amusement, our films, television, novels, our life today. We thus live in difficult and challenging times, but God is still on the throne. Our future comes from him and not this scientific elite. R.J. Rushdoony: 03:15 So, while these are perhaps very difficult times, they are also tremendously exciting and challenging times because we are at the crossroads of history. We have a great and a tremendous opportunity. We must remember that in every age, one with God is a majority. We have a responsibility to remake all things in terms of Christ and his Word and to recognize that we can not give our loyal to anything short of God and his word. R.J. Rushdoony: 03:59 Anything that falls short of that belongs to the enemy. We had an opportunity, and a tremendous one. Men have been fakers. The modern age, from kings down to commoners, has shown their depravity. Now, let us set forth the glory and the righteousness of God and of his kingdom. Let us pray. R.J. Rushdoony: 04:37 Almighty God, our heavenly father, who with thy sovereign grace has called us to be thy people and have given us so glorious an opportunity in this day to set forth thy word in the face of the powers of darkness. We thank thee that thy word shall not return unto thee void, but shall accomplish that whereunto thou doest send it. Empower us therefore by thy grace to stand in thee and by thy word and to be more than conquerors through him that’s loved us. Even Jesus Christ our Lord. In his name we pray, amen. R.J. Rushdoony: 05:28 Let me remind you before we begin our questions that we shall, next week, have a two or three week series on the effect of Platonism on Christianity and we’ll see forms of Platonism around us in the modern political scene. So, I think it is an extremely important subject because I think it will help us to sort out the various Christian and semi-Christian movements around us, as well as to understand the secular movements. It’ll be just as the previous sessions will be, $1 per session and I’ll try to get it in two but it may take three. I’ll know more about that next week. R.J. Rushdoony: 06:26 Now, are there any questions on our lesson? Yes. Speaker 2: 06:32 Could it be the popularity of those books is [inaudible 00:06:33]. When I was in college, everybody [inaudible 00:06:37] for curiosity. R.J. Rushdoony: 06:46 No. They have been very popular and very well received. Brave New World and 1984 were satires on what was coming. These are very sober presentations. Their popularity has been because there are a great many people who like it and who feel they’re going to be on the top of the pile or who feel, “Well, there will be no problems in that kind of a world and I’m fed up with problems.” Many people want to be zombies. This is the whole point, for example, in drugs and the drug culture is now down to the junior high level and seeping down into the grade school level. R.J. Rushdoony: 07:48 Well, sometimes. Speaker 3: 07:48 So, you really don’t, in most positions, the average level you don’t take a risk position responsibility. You work hard for six months till you get past the probation period and then you just show up [inaudible 00:08:03]. R.J. Rushdoony: 08:06 Of course, one of the attractions of jobs with big corporations is precisely that you don’t do any work as a free agent. This is the big appeal to big corporations. They go to the campuses and the prize recruits are many, very often the young radicals that have been demonstrating against them because it’s a sure thing and they like a sure thing. The company isn’t likely to go under and if you go through the motions, you’re there and you get ahead. You move in the right circles, it has a big appeal. Speaker 3: 08:45 A limited risk situation. R.J. Rushdoony: 08:49 A limited risk situation, precisely. Speaker 3: 08:50 What about the executives though who do go higher? They really have to pay the price to get there. R.J. Rushdoony: 09:03 Well, it’s an interesting thing. There was a study recently, I was someplace and I saw this journal and read it on the top executives in major corporations today. This is what happens. When men graduate, say from the Harvard School of Business or the Stanford School of Business and any other major school for business management, many of the top students, of course, land the choice jobs, say with General Electric, General Dynamics, Ford, and so on, with the big corporations in the country. So, right off the bat they’re making from $15,000 to $20,000 as junior executives. But, they never go more than so far. They reach a secondary level and never go further than that. R.J. Rushdoony: 10:09 And what they found in the study was that the men who leave these schools and don’t take these jobs with the big corporations, but get a job with a small company that hires from between 20 and 200 men. And very often will go to work with one of five or six men where they have to hustle. And they make that company grow so that from nothing it begins to mushroom. These are the ones who are chosen for the top offices of the major corporations in the country. In other words, these boards, when they look around find where is there someone who’s been an old fashioned entrepreneur? We’ll have to get him. They always pass over the bright, young executives that they chose for their company. R.J. Rushdoony: 11:12 So, they come from the outside, always now. They’re looking for the person who can take chances and put a company ahead. But the sad fact is that the company they left, now that it’s gotten up there, will start looking around for the sure thing type of management. And then it begins to level off in its growth. R.J. Rushdoony: 11:48 No, it’s another one of these groups of thinkers and planners. And today, since what you have is government by experts, basically, the politicians rely on them. In fact, they feel as if they are naked if they’re not. And the press, the people, the politicians, they all turn on someone who doesn’t rely on them. R.J. Rushdoony: 12:19 Now, this was Lyndon Johnson’s big mistake. After a certain point, he did not rely too much on these people partly because they were so much associated with Kennedy that he felt that he didn’t want a part, any part of that. And, of course, Johnson, who was the best democratic president this country has had in this century and that he did more to accomplish the goals of his party than any democratic president. He did far more to further the platform of his party than FDR ever did. And yet, his party turned against him. Everyone did. He couldn’t have run again for office, and there are some who claim that Humphrey lost because Humphrey did not disavow Johnson. And his big offense was, of course, he broke with all these experts. And they really turned on him. R.J. Rushdoony: 13:28 And, of course, this is one thing that Nixon is fast trying to catch up on. And this is why he has men like Kissinger and others around him. He has a scientific elite around him, because this what the modern man likes. He definitely does. Again and again this has been demonstrated. This is the appeal. We are living in a scientific age and people love a scientifically governed thing. It means a sure thing to them. R.J. Rushdoony: 14:06 And, of course, they distrust politicians, so if the politician wants to improve his image, he gets the scientist because there he is relying on really superior people. Speaker 5: 14:24 It’s interesting to note that many issues of the Scientific American magazine has more articles on social issues than medical articles. R.J. Rushdoony: 14:33 Very true. A very good point. And this true now of Natural History, which I’ve delighted in for years, but it’s getting to be more and more political. And this is because when you are talking about science today, you’re talking about politics. So that the scientists today are about as political as the republican and democratic parties, and maybe more so because a lot of the republican women’s activities and the democratic women’s activities are more social than political. So, the parties today are not too politically oriented. R.J. Rushdoony: 15:23 It’s a part of the scientific world because the essence magic and witchcraft is total control by man over man, nature, and anything beyond nature. And this is exactly what these books are talking about, you see. So, science today has become magic. And so it’s ready to talk about magic. It’s ready to have magical goals. It’s ready to explore any subject as an open question, except God. Speaker 6: 16:00 Are the [inaudible 00:16:00] the magicians then? R.J. Rushdoony: 16:02 Yes. They’re the new magicians. After all, when they talk about the kind of thing that these books do about making men and abolishing death and reversing the first and second law of thermodynamics, you know, just changing the whole nature of the creation. They are talking, well, they are putting the old magicians to shame. They were pikers by comparison. R.J. Rushdoony: 16:42 Well, the purpose is basically this, first of all he is a politician. Every president is a politician first. Now, what he wants to do is to stimulate the economy, our balance of payment situation is very bad, so here is the biggest market in the world. If he can open it up for selling, think how he can help the whole balance of payment situation. So, that’s the whole purpose, to open it up. R.J. Rushdoony: 17:35 Now, of course, the kind of trade we will get is very deadly one. They are telling us the Chinese are very good at payment, very prompt. Well, how do they pay? They pay off and anything that they have that they want to send to you on their terms, they’ll put a price, say, on the hog bristles they are going to give you. So, if you are selling them airplanes or trucks, you’ll wind up with more hog bristles than you know what to do with. And you’re not merchandising hog bristles. But what do you do? Well, Jack Bizard was telling me what happened to his company recently because they were dealing with … may I tell this story? R.J. Rushdoony: 18:18 With Douglas, and Douglas had sold planes to Yugoslavia. And Yugoslavia paid them off with hams. So, Douglas paid off their suppliers with hams. Tell them you are going to take hams instead of money. Period. Now, this is the way they are going to solve the balance of payment deficit, you see. The big corporations won’t be hurt, they’ll just pass it on to their suppliers, you see. And this is the way they are going to make business, you see. So, that’s it, basically. R.J. Rushdoony: 18:53 Now, they are hoping by the first quarter of ’72 they will have a very favorable balance of payment picture. Yes. Speaker 8: 19:03 Senator Smith’s had a good comment on that. He said he had no quarrel with Nixon going to China, but he did have a quarrel with him coming back. Speaker 9: 19:10 [inaudible 00:19:10] talking about these contests that specify [inaudible 00:19:10] dollars. Is there any way for these various companies, even smaller companies, making them stick to the agreement, the dollars involved. R.J. Rushdoony: 19:33 Oh, of course. Of course, they can get the dollars but they won’t get any more business. And they’ll be wiped out. If you cannot sell to the big companies, you are a small supplier, they’re your market. You’re at their mercy and if they are going to pay you off with hams and hog bristles, you’re going to take hams and hog bristles. Speaker 10: 19:58 All these things, it’s pretty hard for me to see the Christian world that’s supposed to be ahead of us. R.J. Rushdoony: 20:05 Yes, but remember it was much harder for the Christians in the arena to see any possibility of victory when every Christian was doomed, was going to be exterminated. It must have been very hard for them, but they did have that faith. And they were right. And, you see, it isn’t by sight that we walk, but by faith. So, we have to say it is true. R.J. Rushdoony: 20:40 Now, the big argument, for example, that Hal Lindsey uses against post-millennialism and that Jay Adams uses against post-millennialism is that, look at the papers, how can it be true. Well, if you look at the papers, there’s no God either. But we’re not to look at the papers but to God and his word. And in terms of that, why, if the ungodly flourish, the psalmist says, it is that they be destroyed. So, they’re going to be destroyed and that’s our confidence. Speaker 10: 21:27 They always are. Speaker 10: 21:27 That book of Mary Bunyan, Bunyan’s daughter? Speaker 10: 21:27 Did you read that? R.J. Rushdoony: 21:35 Yes. It’s a beautiful story. R.J. Rushdoony: 22:03 That’s Hal Lindsey, that’s who I just referred to, stay away from it. Speaker 11: 22:07 [inaudible 00:22:07] I was struck by the parallels of the things that would be indicative of another tribe or another people, the beliefs and things that they do to sustain the things, are parallel between those things and things that they do in the modern world and feel like they are so awesome and necessary. And you’re bringing up this delusion of science and the betrayal of science, it just shows us again so clear. One of my disappointments is people argue against scientific things, [inaudible 00:22:51] and the welfare state and realize [inaudible 00:22:54] and people earned it are really paying for it. And this is what’s going down, but I think what’s really amazing is how little [inaudible 00:23:10] in this scientific vision that they dangle in front of you. I mean, there’s nothing, the scientific theories that seem so fabulous really are as absurd of a dream as a mumbo jumbo back jungle, any kind of dream. R.J. Rushdoony: 23:31 Yes. You mentioned Mexico and that’s a very good point. When the Spaniards went into Mexico, the Aztecs, Montezuma had total power. And the Spanish were just a handful. And what very few people realize is the only way the handful of Spaniards overthrew the Aztec Empire was because the people had reached the limit. They were filled up to here with horror with the totalitarian regime of the Aztec power and of Montezuma. Human sacrifice was a routine thing. The common people were like animals to be slaughtered. There was an elite class that fed on human meat and it was openly sold in markets. And they felt that they would grow stronger on it. R.J. Rushdoony: 24:26 And it had reached the point where anything was better. And the Spaniards were cruel, but that cruelty was preferable. And so, the empire collapsed. This is why today the Soviet Union, while it is so tremendously powerful, far more powerful than we are militarily, is afraid of its own people because they’ve pushed them, they’ve murdered them to a point where they don’t care anymore. And you have some of the prominent scientists and writers there smuggle out their books, which are protests against what’s going on there and they are being published in this country. They are ready to take what may be dished out to them for the simple reason they feel, what’s the use any longer? R.J. Rushdoony: 25:13 Now, that’s what’s ahead of us. Disillusionment to the point where the thing crumbles. Assyria was the most powerful empire in all history. Terrorizing everyone, but suddenly it crumbled, almost overnight. Well, to change the subject from things rather grim to something much lighter veins, some months ago I read to you from the California Farmer, the editor, Jack Pickett’s account of his prize bull, Charlie. And people have written to him, “Is Charlie real?” Or “Isn’t this true?” And in fact, at Kelseyville, they decided they wanted to put it to the test, is there a real Charlie? If so, bring him up and let’s have him in the parade. R.J. Rushdoony: 26:28 Then he goes on to say he took him to Nevada recently for a breeding, then took him to another ranch. And he said, “It was lunchtime and the cowboys were gathered down near the corral. Charlie was going through all his idiot tricks trying to snaggle a beer from one of the boys. He’s gotten to be very fond of beer. He was single footing it back and forth. Then he would try a fancy step, but the boys were not buying that day. R.J. Rushdoony: 27:03 Suddenly they saw Charlie’s tail go straight up in the air. There on the other side of the corral was a big feral doe. This doe was getting fat off of Charlie’s feed. We had seen her crawl under the corral, it is amazing how small a place deer can get through by getting down on their bellies and crawling. Charlie’s eyesight isn’t so great anymore. He used to know enough not to chase deer, but to him this looked like a Jersey heifer with his eyesight being what it was. R.J. Rushdoony: 27:33 Showing frightful manners and with no attempt to get acquainted, that bull just took off like Geronimo and charged. That doe looked up to see this frightful thing hurtling at her. She turned, and tucking her feet under her, sailed over the corral like a thing of beauty. Charlie had a quick decision to make, either hit the brakes or try for the top pole of the corral. He chose the latter, imitating the doe. Tucking his feet under him, he sailed into the corral. His head hit. Then his body rolled up against the rails and he finally sank head first down to the ground. Did a momentary head stand, then crashed over on his side. R.J. Rushdoony: 28:19 Well, Charlie got his beer. That’s what it took to bring him out of dreamland. The boys supported him back to his bachelor quarters where they made him comfortable. Shorty came and got me and we decided that outside of a terribly sore everything, he was going to live. R.J. Rushdoony: 29:12 Meanwhile, Charlie’s fame had preceded him. A guy with a beautiful herd right out of Middletown had asked for Charlie’s services. I told him I was bringing Charlie up to Lake County and right past his door. But I told him that Charlie was too racked up from a broad jumping experience to be of any good. R.J. Rushdoony: 29:31 Well, this guy leaked the news that Charlie was coming and we got another letter from Kelseyville asking if Charlie were real and could he lead their big annual Tourist Plucking and Muskrat Skinning Day parade? We knew Charlie would be in his ham bone glory, so we said okay. R.J. Rushdoony: 29:48 We made it to Kelseyville just in time. The parade was just forming. They had a lot of effort put into colorful clothes. The natives gasped when they saw Charlie get out of the front seat. And Shorty had a short scuffle getting a lead halter on him. R.J. Rushdoony: 30:05 Well, all was ready and everybody in the place for the long hike through greater downtown Kelseyville, when a guy from the excellent little local paper called, The Clear Lake Observer, stepped right up in front of Charlie and took a flash picture. Charlie thought the world had fallen down. Instead of leading the parade, that dumb bull disemboweled it. People were scattering. Floats were exploding in magnificent bursts of colors. He wiped out the entire parade. 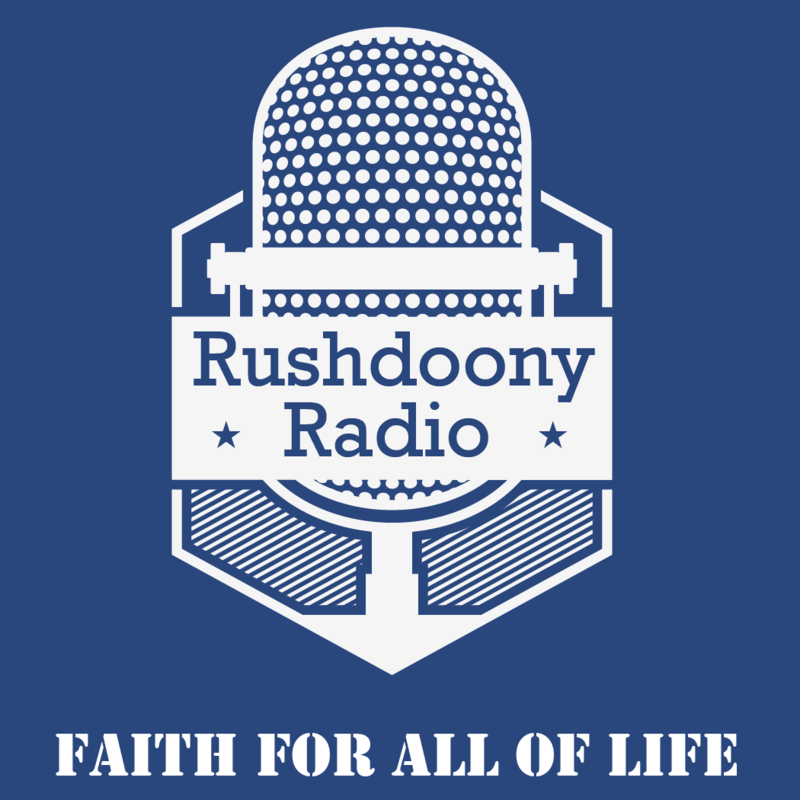 R.J. Rushdoony: 31:11 And with that, we are adjourned.